Cacao Alcohol-FREE Liquid Extract, Organic Cacao (Theobroma cacao) Raw Beans Glycerite Features and description: ALCOHOL FREE! NON GMO! GLUTEN FREE! Expertly extracted Cacao (Theobroma cacao) ALCOHOL-FREE liquid extract! Cacao Glycerite contains O..
Cacao Liquid Extract, Organic Cacao (Theobroma cacao) Raw Beans Tincture Features and description: NON GMO! Gluten Free! Highest Strength Cacao (Theobroma cacao) liquid extract! Cacao liquid extract contains ONLY natural ingredients! High Quality ..
Calamus Alcohol-FREE Liquid Extract, Organic Calamus (Acorus Calamus) Dried Root Glycerite Features and description: ALCOHOL FREE! NON GMO! GLUTEN FREE! Expertly extracted Calamus ALCOHOL-FREE liquid extract! Calamus Glycerite contains ONLY natura..
Calamus and Ginger Alcohol-FREE Herbal Liquid Extract, Organic Calamus and Organic Ginger Dried Root Glycerite Features and description: ALCOHOL FREE! NON GMO! GLUTEN FREE! Highest Strength, Highest Quality Calamus and Ginger NON-Alcohol li..
Calamus and Ginger Liquid Extract, Organic Calamus (Acorus calamus) and Organic Ginger (Zingiber officinalis) Dried Root Tincture Features and description: NON GMO! Gluten Free! Highest Strength, Highest Quality Calamus and Ginger liquid extract! ..
Calamus Liquid Extract, Organic Calamus (Acorus Calamus) Dried Root Tincture Features and description: NON GMO! Gluten Free! Highest Strength Calamus liquid extract! Calamus liquid extract contains ONLY natural ingredients! High Quality Calamus li..
Calea Liquid Extract, Calea (Calea Zacatechichi) Dried Leaf Tincture Features and description: NON GMO! Gluten Free! Highest Strength Calea Zacatechichi liquid extract! Calea Zacatechichi liquid extract contains ONLY natural ingredients! H..
Calea NON-Alcohol Liquid Extract, Calea (Calea Zacatechichi) Dried Leaf Glycerite Features and description: ALCOHOL FREE! NON GMO! GLUTEN FREE! Highest Strength Calea Zacatechichi NON-Alcohol liquid extract! Calea Zacatechichi NON-Alcohol ..
Calendula (Calendula Officinalis) Organic Dried Flower Veterinary Natural Alcohol-FREE Liquid Extract, Pet Herbal Supplement Features: ALCOHOL-FREE! NON GMO! GLUTEN FREE! Hawaii Pharm Calendula Pet Supplement contains no GMO, gluten, heavy metals,..
Calendula-Comfrey, Veterinary Natural Alcohol-FREE Liquid Extract, Pet Herbal Supplement Features: ALCOHOL-FREE! NON GMO! GLUTEN FREE! Hawaii Pharm Calendula-Comfrey Supplement contains no GMO, gluten, heavy metals, artificial colors, preservative..
California Poppy Alcohol-FREE Liquid Extract, California Poppy (Eschscholzia Californica) Seeds Glycerite Features and description: ALCOHOL FREE! NON GMO! GLUTEN FREE! Expertly extracted, Super concentrated California Poppy ALCOHOL-FREE liquid ex..
California Poppy Alcohol-FREE Liquid Extract, Organic California Poppy (Eschscholzia Californica) Dried Above-Ground Part Glycerite Features and description: ALCOHOL FREE! NON GMO! GLUTEN FREE! Expertly extracted California Poppy ALCOHOL-FREE liqu..
California Poppy and Hawthorn, California Poppy Aerial Parts, Hawthorn Leaf and Flower Glycerite Features and description: ALCOHOL FREE! NON GMO! GLUTEN FREE! Highest Strength, Super concentrated California poppy and Hawthorn NON-Alcohol liquid e..
California Poppy and Hawthorn, California Poppy Aerial Parts, Hawthorn Leaf and Flower Tincture Features and description: NON GMO! Gluten Free! Highest Strength, Super concentrated California poppy and Hawthorn liquid extract! California poppy and..
California Poppy and Kava Kava Alcohol-FREE Herbal Liquid Extract, Organic California Poppy and Kava Kava Dried Root Glycerite Features and description: ALCOHOL FREE! NON GMO! GLUTEN FREE! Only from Hawaii Pharm - Highest Strength, Highest Quality..
California Poppy and Kava Kava Liquid Extract, Organic California Poppy and Kava Kava Dried Root Tincture Features and description: NON GMO! Gluten Free! Only from Hawaii Pharm - Highest Strength, Highest Quality California Poppy and Kava Kava ext..
California Poppy and Lavender, California Poppy Aerial Parts, Lavender Flower Glycerite Features and description: ALCOHOL FREE! NON GMO! GLUTEN FREE! Highest Strength, Super concentrated California poppy and Lavender NON-Alcohol liquid extract! C..
California Poppy and Lavender, California Poppy Aerial Parts, Lavender Flower Tincture Features and description: NON GMO! Gluten Free! Highest Strength, Super concentrated California poppy and Lavender liquid extract! California poppy and Lavender..
California Poppy and Passionflower, California Poppy Aerial Parts, Passionflower Leaf and Stem Glycerite Features and description: ALCOHOL FREE! NON GMO! GLUTEN FREE! Highest Strength, Super concentrated California poppy and Passionflower NON-Alc..
California Poppy and Passionflower, California Poppy Aerial Parts, Passionflower Leaf and Stem Tincture Features and description: NON GMO! Gluten Free! Highest Strength, Super concentrated California poppy and Passionflower liquid extract! Califor..
California Poppy and St John's Wort Alcohol-FREE Herbal Liquid Extract, Organic California Poppy and St John's Wort Glycerite Features and description: ALCOHOL FREE! NON GMO! GLUTEN FREE! Only from Hawaii Pharm - Highest Strength California Poppy ..
California Poppy and St John's Wort Liquid Extract, Organic California Poppy Dried Aerial Parts and St John's Wort Dried Flower Tincture Features and description: NON GMO! Gluten Free! 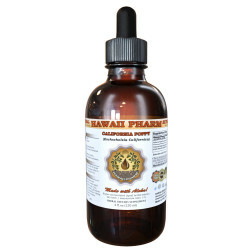 Only from Hawaii Pharm - Highest Strength California Poppy and..
California Poppy and Valerian Alcohol-FREE Herbal Liquid Extract, Organic California Poppy and Valerian Root Glycerite Features and description: ALCOHOL FREE! NON GMO! GLUTEN FREE! Only from Hawaii Pharm - Highest Strength, Highest Quality Califor..
California Poppy and Valerian Liquid Extract, Organic California Poppy Dried Aerial Parts and Valerian Dried Root Tincture Features and description: NON GMO! Gluten Free! Only from Hawaii Pharm - Highest Strength, Highest Quality California Poppy ..
California Poppy Liquid Extract, California Poppy (Eschscholzia Californica) Seeds Tincture Features and description: NON GMO! Gluten Free! Highest Strength, Super concentrated California Poppy liquid extract! California Poppy tincture contains ON..
California Poppy Liquid Extract, Certified Organic California Poppy (Eschscholzia Californica) Dried Above-Ground Parts Tincture Features and description: NON GMO! Gluten Free! Highest Strength California Poppy liquid extract! California Poppy liq.. Calm Kitty, Veterinary Natural Alcohol-FREE Liquid Extract, Pet Herbal Supplement Features: ALCOHOL-FREE! NON GMO! GLUTEN FREE! Hawaii Pharm Calm Kitty Supplement contains no GMO, gluten, heavy metals, artificial colors, preservatives or sy..
Camucamu Alcohol-FREE Liquid Extract, Camucamu (Myrciaria Dubia) Dried Fruit Glycerite Features and description: ALCOHOL FREE! NON GMO! GLUTEN FREE! Expertly extracted Camucamu ALCOHOL-FREE liquid extract! Camucamu Glycerite contains ONLY natural..
Camucamu Liquid Extract, Camucamu (Myrciaria Dubia) Dried Fruit Tincture Features and description: NON GMO! Gluten Free! Highest Strength Camucamu liquid extract! Camucamu liquid extract contains ONLY natural ingredients! High Quality Camucamu liq..
Cang Zhu Alcohol-FREE Liquid Extract, Cang Zhu, Atractylodes (Atractylis Lancea) Root Glycerite Features and description: ALCOHOL FREE! NON GMO! GLUTEN FREE! Expertly extracted Cang Zhu ALCOHOL-FREE liquid extract! Cang Zhu Glycerite contains ONL..
Cang Zhu Liquid Extract, Cang Zhu, 苍术, Atractylodes (Atractylis Lancea) Root Tincture Features and description: NON GMO! Gluten Free! Highest Strength Cang Zhu liquid extract! Cang Zhu liquid extract contains ONLY natural ingredients! High Quality..
Caraway Alcohol-FREE Liquid Extract, Organic Caraway (Carum carvi) Dried Fruit Glycerite Features and description: ALCOHOL FREE! NON GMO! GLUTEN FREE! Expertly extracted Caraway ALCOHOL-FREE liquid extract! Caraway Glycerite contains ONLY natural ..
Caraway Liquid Extract, Organic Caraway (Carum carvi) Dried Fruits Tincture Features and description: NON GMO! Gluten Free! Highest Strength Caraway liquid extract! Caraway liquid extract contains ONLY natural ingredients! High Quality Caraway liq..
Cardamom Alcohol-FREE Liquid Extract, Organic Cardamom (Elettaria cardamomum) Dried Seed Glycerite Features and description: ALCOHOL FREE! NON GMO! GLUTEN FREE! Expertly extracted, Highest Quality Cardamom ALCOHOL-FREE liquid extract! Crude Cardam..
Cardamom Liquid Extract, Organic Cardamom (Elettaria cardamomum) Dried Seed Tincture Features and description: NON GMO! Gluten Free! Highest Strength, Highest Quality Cardamom liquid extract! Crude Cardamom extract of first cold extraction! Cardam..
Carob Alcohol-FREE Liquid Extract, Organic Carob (Ceratonia Siliqua) Dried Raw Seeds and Pods Glycerite Features and description: ALCOHOL FREE! NON GMO! GLUTEN FREE! Expertly extracted Carob ALCOHOL-FREE liquid extract! Carob Glycerite contains ON..
Carob Liquid Extract, Organic Carob (Ceratonia Siliqua) Dried Raw Seeds and Pods Tincture Features and description: NON GMO! Gluten Free! Highest Strength Carob liquid extract! Carob liquid extract contains ONLY natural ingredients! High Quality C..
Carpal Tunnel Syndrome Care Liquid Extract, Bromelain, Turmeric Dried Root, Cat's Claw Dried Inner Bark Tincture Herbal Supplement Features and description: NON GMO! Gluten Free! Highest Strength Carpal tunnel syndrome care liquid extract! .. Carrot Alcohol-FREE Liquid Extract, Carrot (Daurcus Carota) Dried Root Glycerite Features and description: ALCOHOL FREE! NON GMO! GLUTEN FREE! Expertly extracted Carrot ALCOHOL-FREE liquid extract! Carrot Glycerite contains ONLY natural ingredien.. Carrot Liquid Extract, Carrot (Daurcus Carota) Dried Root Tincture Features and description: NON GMO! Gluten Free! Highest Strength Carrot liquid extract! Carrot liquid extract contains ONLY natural ingredients! High Quality Carrot liquid extract-..
Cascara Alcohol-FREE Liquid Extract, Cascara (Rhamnus Purshiana) Dried Bark Glycerite Features and description: ALCOHOL FREE! NON GMO! GLUTEN FREE! Expertly extracted Cascara ALCOHOL-FREE liquid extract! Cascara Glycerite contains ONLY natural ing..
Cascara Liquid Extract, Cascara (Rhamnus Purshiana) Dried Bark Tincture Features and description: NON GMO! Gluten Free! Highest Strength Cascara liquid extract! Cascara liquid extract contains ONLY natural ingredients! High Quality Cascara liquid ..
Cassia Alcohol-FREE Liquid Extract, Organic Cassia (Cinnamomum cassia) Dried Bark Glycerite Features and description: ALCOHOL FREE! NON GMO! GLUTEN FREE! Expertly extracted Cassia ALCOHOL-FREE liquid extract! Cassia Glycerite contains ONLY natural..
Cassia Liquid Extract, Organic Cassia (Cinnamomum cassia) Dried Bark Tincture Features and description: NON GMO! Gluten Free! Highest Strength Cassia liquid extract! Cassia liquid extract contains ONLY natural ingredients! High Quality Cassia liqu..
Cat Bladder Urinary Tract Support, Veterinary Natural Alcohol-FREE Liquid Extract, Pet Herbal Supplement Features: ALCOHOL-FREE! NON GMO! GLUTEN FREE! Hawaii Pharm Cat Bladder Urinary Tract Support Supplement contains no GMO, gluten, heavy ..
Cat's Claw Alcohol-FREE Liquid Extract, Cat's Claw (Uncaria Tomentosa) Dried Inner Bark Glycerite Features and description: ALCOHOL FREE! NON GMO! GLUTEN FREE! Expertly extracted Cat's Claw ALCOHOL-FREE liquid ext..
Cat's Claw Liquid Extract, Cat's Claw (Uncaria Tomentosa) Dried Inner Bark Tincture Features and description: NON GMO! Gluten Free! Highest Strength Cat's Claw liquid extract! Cat's Claw liquid extract contains ONLY natural ingredients! Hi..
Catnip Alcohol-FREE Liquid Extract, Organic Catnip (Nepeta Cataria) Dried Leaf and Flower Glycerite Features and description: ALCOHOL FREE! NON GMO! GLUTEN FREE! Expertly extracted Catnip ALCOHOL-FREE liquid extract! Catnip Glycerite contains ONLY..
Catnip Liquid Extract, Organic Catnip (Nepeta Cataria) Dried Leaf and Flower Tincture Features and description: NON GMO! Gluten Free! Highest Strength Catnip liquid extract! Catnip liquid extract contains ONLY natural ingredients! High Quality Cat..
Catnip Veterinary Natural Alcohol-FREE Liquid Extract, Pet Herbal Supplement Features: ALCOHOL-FREE! NON GMO! GLUTEN FREE! Hawaii Pharm Catnip Pet Supplement contains NO Alcohol, GMO, gluten, heavy metals, artificial colors, preservatives or synth..